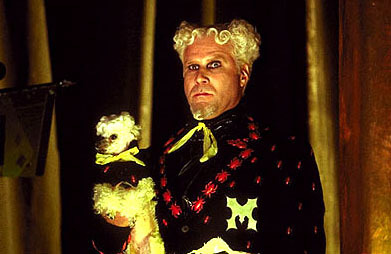 This hilarious faux couture costume was worn by the character Mugatu portrayed by comedian/actor Will Ferrell in the motion picture Zoolander which also starred Ben Stiller and Owen Wilson. 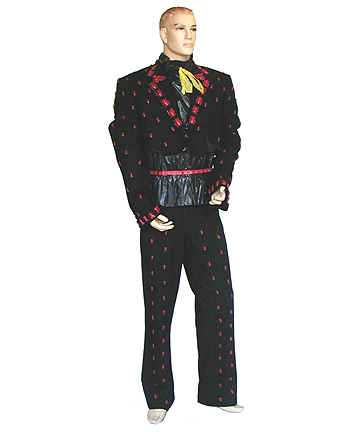 The costume consists of a pair of black pants and black jacket that are both covered in hand applied red painted metallic bugs, along with a corset piece constructed of a black plastic garbage bag and bolo tie piece (actually garbage bag plastic tie handles). The costume is in very good condition with some minor loss of paint on the bugs that occurred during filming. Will Ferrell is one of the funniest performers working in film today and this amazing costume worn by one of his most memorable characters is an absolute must for your collection. 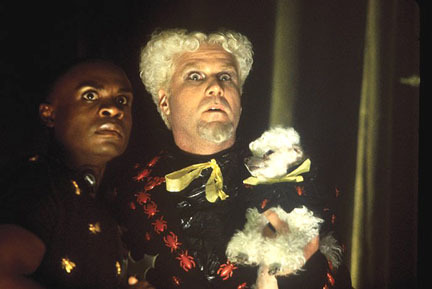 Included is an image of the actor wearing the piece in a scene from the film. Accompanied by a letter of authenticity from the costume house.